String a fire-polished bead, two seed beads, a fire-polished bead and two seed beads. Step 3: String a bicone crystal, two seed beads and a bicone crystal. Step 5: String a fire-polished bead, two seed beads and a fire-polished bead. 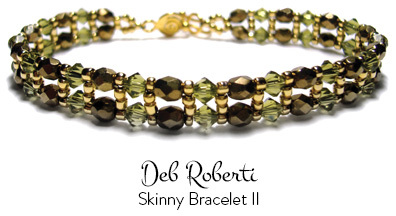 Now you'll add a row of seed beads in between each fire-polished bead and bicone crystal along the top of your bracelet. Now you'll add a row of seed beads in between each fire-polished bead and bicone crystal along the bottom of your bracelet. Repeat Step 17 to Step 19.